When Chris Atkinson bought a farm near the South Island fishing village of Motunau, he discovered the only access to open water was over a tiny, very shallow and often treacherous Motunau bar. To fish offshore, he needed a tough but sea-kindly jet boat. The Seahouse 7200 proved just the ticket. Paul Smith reports. 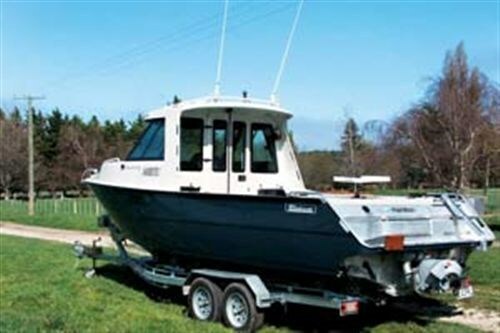 Atkinson chanced upon the 7200 (built by Dunedin's Seahouse Boats) at the Christchurch Boat Show in July 2004 where it received the "Best Aluminium Boat of Show" award. Examination showed it to be powerfully built. Seahouse owner/director Paul Rutter designed the hull, topsides and overall styling of the vessel with plenty of curvature - a deliberate move away from the squareness which characterizes much production-based, alloy boat fabrication. Constructed from marine grade 5083 aluminium alloy, the hull bottom is folded from 5mm alloy plate while sides and gunnels are formed from 4mm plate. The transom is 4mm or 5mm (depending upon the propulsion method selected), and the topsides, deck and hardtop are all 3mm plate. The hull is strengthened with six longitudinal bearers, three either side of the keel. They're supplemented by a lattice of cross bracing. The boat's rigidity stems from the use of a heavy floor and a strong, box-section gunnel support. The hull lines follow a deep vee form with a variable deadrise culminating in 19 degrees at the transom. To dampen ride and water noise, there are no planing strakes. Lift is provided by the hull's reasonably broad shoulders and the turned down chines are wide and carried well for'd. Similar designs have proven less than ideal for waterjet propulsion since they rely on the low thrust line of a leg or prop (ie below water) to prevent or at least minimize bow steering tendencies. Since a waterjet has a thrust line directly through the transom and above the waterline, the hulls need to generate plenty of lift for'd to prevent broaching in a following sea. To accommodate waterjet propulsion, Rutter modified the hull's design to include a delta keel section for locating the waterjet intake. He installed the waterjet on a 2.5 degree jet block rather than the usual four to five degrees. Outboard and stern drive powered Seahouse boats retain the conventional vee bottom keel since the delta is not required. 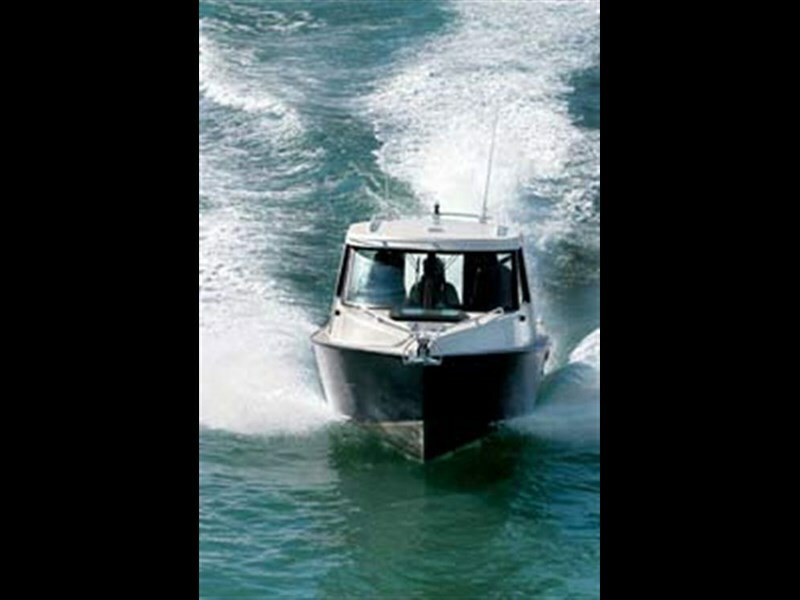 All of the larger boats in the Seahouse range are custom built to the purchaser's requirements. Miritu's bow is capped by a solid, fully welded alloy "tandem" bowsprit which incorporates a self-locking roller system for the anchor (controlled by a Muir anchor winch). Adjacent to this is a shorter sprit with its own roller for dealing with mooring lines. Access to the bow is via walkaround decks some 200mm wide, either side of the forecabin. Bow rails were deliberately omitted in favour of strong grab rails along each side of the cabin and hardtop roofs. Natural light in the fore cabin is courtesy of a large, rearward opening hatch. There are vee berths either side (with storage under), which can be converted to a double using infills. The vee berths can be extended in length by lifting the removable treadplate footrests and fitting purpose built, upholstered alloy extensions. There is provision for fitting a marine toilet under the berths. The cabin has considerably more space than is first apparent due to the increasing sheerline of the hull form, with plenty of depth going for'd. There are spacious parcel trays each side and all surfaces have been lined. Presentation of fit and finish is to a very high standard. An instrument binnacle on top houses MarinePower gauges monitoring engine functions and include tachometer, engine coolant temperature, oil pressure, voltmeter and fuel. Below is a Lowrance LX104C Sonar/GPS/Chartplotter with a 10.5-inch colour screen, GME Marine CD Player/Radio and Navman VHF. The Morse cable helm system is set up for one turn - lock-to-lock. Located either side of the wheel are controls for the anchor winch, electric over hydraulic trim tabs and the remote roof mounted spotlight. Throttle and forward/reverse actuators are mounted on the starboard coaming and are easily operated whether standing or sitting. Two seats are mounted on alloy bases. The helm seat has plenty of storage under the removable cushions, while the passenger seat base houses a small refrigerator compartment. An insert can be erected between the seats to create a full width, athwartships bench. The two-piece curved windscreen is formed in 6mm safety glass. Cockpit access from the wheelhouse is via a bi-fold door. Seating is protected by the wheelhouse roof extension - which also supports grab rails across the back of the roof and vertical rails down either side to the cockpit coamings. These are wide and, built to IGF height, provide plenty of support when wielding the rod. Two full-length, lined trays for rod, gaff and other fishing paraphernalia storage are set into the coamings. Two rod holders either side, and a further two across the transom provide sufficient rod storage, although a roof mounted rocket launcher could easily be fitted. Large lockers with SoPac hatches are fitted either side of the engine box, housing batteries to starboard (house and engine) and general storage to port. The treadplate alloy cockpit sole covers sealed buoyancy chambers either side which extend for'd to the front of the wheelhouse. The central compartment houses the 270-litre alloy fuel tank. A 10mm thick soft neoprene fitted floor mat is easy to wash down and provides a welcome softness underfoot. The engine compartment is fully sealed from and is ventilated by a ducting system that provides plenty of cool clean air to the engine. A full-width boarding platform (fabricated in treadplate alloy) provides cover for the waterjet, with a mount on the port side for the auxiliary motor. Of the seven Seahouse Libertys already built, one has been fitted with a sterndrive (Volvo duoprop) and one with a waterjet (Miritu). The rest are outboard powered. 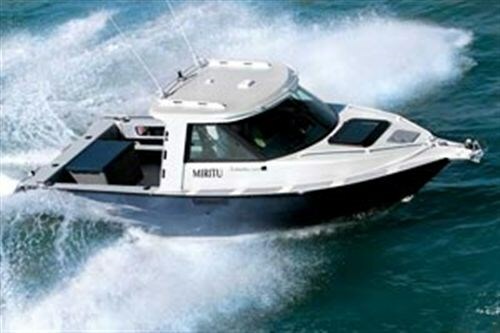 Miritu's MarinePower six-litre, V8 engine is based on a Vortec marine block supplied by GM. It's close-coupled to a Hamilton HJ212 waterjet fitted with the standard stainless steel turbo style impeller rated at 2.4kW. Unlike most boat reviews where we have a limited time to evaluate the performance and handling of a boat, we were able to experience the Seahouse in a variety of sea conditions. It's a solid, rigid hull that feels reassuringly tight even when the boat is being pushed hard into breaking surf. This is reinforced by the lack of water noise from the hull - it feels very much like a solid GRP boat on the water. 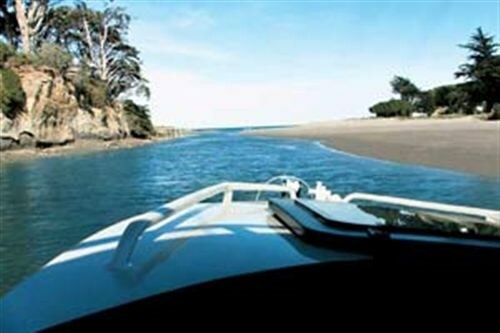 Our first excursion in Miritu demonstrated exactly why waterjet propulsion was preferred for this application - skimming across the Motunau river's sand flats in just 150mm of water at 50kph toward the bar. A couple of easy jumps and we were into open water. We stooged about for a couple of hours, dropping our lines and quickly catching a feed of nice blue cod. On our way back down the coast we hugged the surf line playing about in the rollers and cresting waves. The boat handled these very moderate sea conditions with ease. A week later we were back, this time on a mission for hapuka some 20 miles offshore. On this occasion the sea was very confused and the bar was being hammered by large, cresting waves on the incoming tide. Our transition to open water was exciting to say the least, with the Miritu frequently taking to the air. For 30 minutes we forged our way out to sea, the tachometer showing 3600rpm and the tabs set to allow the boat to track against the combined wind and sea from the port bow quarter. Despite the harsh conditions, the waterjet remained primed and delivered good drive with cavitation only becoming apparent when the boat was driven hard off the top of a wave to become airborne. The journey back proved pleasant with the Seahouse riding the following sea effortlessly. I found the boat relaxing to helm at a comfortable 23-knot cruise at 3600rpm. The boat gave no indication of bow steer and responded nicely to the helm. It should be noted that the general fore and aft trim of the boat benefited from the jet nozzle having being turned over into the 'up' position from the factory 'down' setting, and this would be a recommendation for any subsequent waterjet propelled 7200s. A photo session on the Waimakariri river bar the following week provided an opportunity to compare Miritu with a 7200 Extra Cab model fitted with a 250hp Suzuki outboard. Both Seahouse versions handled the conditions with ease. We noticed the Suzuki powered boat was significantly quieter than the jet - especially at slow to medium speeds. However, the jet proved easier to manoeuvre and more responsive at all speeds. Anecdotal evidence suggests the Suzuki V6 engines deliver their best fuel economy after some 50 hours of running, and consumption of 22 litres per hour at cruising speeds around 3400-3500rpm is typical. The speeds recorded are comparable to the jet performance with maximum speed of 73kph being recorded at 6000rpm. Miritu's V8 provides plenty of grunt off the mark and its sweet cruising speed is at 3600rpm. At this speed the waterjet absorbs close to 140hp and this translates to a boat speed of around 45kph (22-23 knots). At wide-open throttle, the engine is turning at 4400rpm and the jet at this speed absorbs 274hp giving a boat speed of 71kph (approx 35 knots). On a sustained cruise at 3600rpm fuel consumption has been measured at 35 litres per hour. Miritu has been set up primarily as a dayboat. However, a removable pod containing a basin, water supply, two-burner hob and gas bottle is currently being developed to allow the boat to be used for overnighting or weekending. She travels on a Mudgeway tandem axle galvanized steel multi-roller trailer fitted with stainless steel callipers and bronze rotors actuated by a Hydra Star electric over hydraulic fully adjustable braking system. The overall towing weight of the boat is 2460kg with 60 litres of fuel aboard. The Extra Cab fitted with a 250hp Suzuki has a towing weight of 2320kg lightly loaded and 2.5 tonnes full. With a recommended retail price of $128,000 as reviewed, I believe Miritu offers very good value for money. 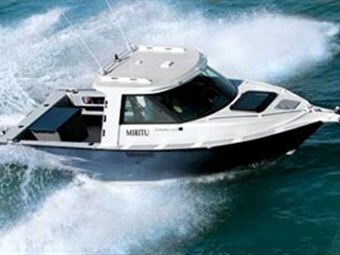 The Suzuki outboard powered Extra Cab version fitted with all the bells and whistles and a comprehensive electronics package retails at $148,000 from Christchurch's Butler Marine Ltd.